In this highly person journey, Nyarri shares the story he has been waiting to tell. 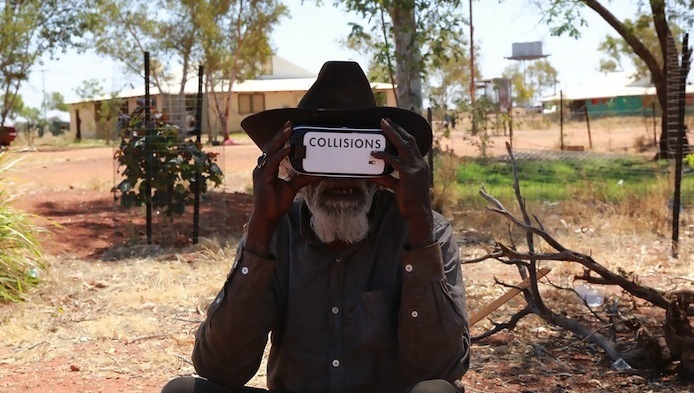 ADL Film Fest and the Art Gallery of South Australia co-present the Australian Premiere exhibition of artist Lynette Wallworth’s bold virtual reality screen project, Collisions. Now the most cutting edge, innovative technology allows you to join Martu elder Nyarri Nyarri Morgan in an unprecedented way, by the fire in the Pilbara in Western Australia. Nyarri’s first contact with Western culture came in the 1950s via a dramatic collision between his traditional world view and the cutting edge of Western science and technology when he witnessed firsthand, and with no context, an atomic test. Since the world premiere at the World Economic Forum, Davos and Sundance New Frontier, Collisions has been selected to screen at numerous prestigious screen events, congresses and venues including the Tribeca Film Festival, the Museum of Modern Art in New York, the Climate Action Summit in Washington D.C., the World Science Festival at the American Museum of Natural History, Encounters Documentary Film Festival (South Africa), the Comprehensive Test Ban Treaty Organization Meetings in Vienna, the Mongolian Cultural Festival and the Timbie Forum (on disarmament) at the US State Department, among many others.